Optomec, a privately-held, rapidly growing supplier of additive manufacturing systems, has recently announced new 3D printing technology that has significant potential to reduce the cost and size of next-generation products used in the electronics and bio-medical industries. Aerosol Jet 3D Printed Micro-structure showing freestanding, millimeter wave dipole antenna. This groundbreaking solution, called Aerosol Jet Technology, can enable 3D polymer and composite structures to be printed at the micron scale with embedded electronics. According to the company, the new technology combines its proven Aerosol Jet solution for fine feature printing with a proprietary in-situ curing capability for rapid on-the-fly solidification to enable the highest resolution features available. “This breakthrough in 3D printing technology extends additive manufacturing to the creation of micron scale, free-form polymer structures and smart devices,” said Mike O’Reilly, Optomec Director Aerosol Jet Product Management, adding that early adopter customers have already developed innovative applications for smart devices and micro-fluidic applications. The process allows for free-form 3D structures to be printed at the micron-scale, without the need for support structures, from materials including photopolymers and certain composites. Optomec said the resulting structures can be metallised with conformal 3D conductive traces and printed functional components, such as antennas and sensors, to create fully functional 3D components all in one manufacturing machine. 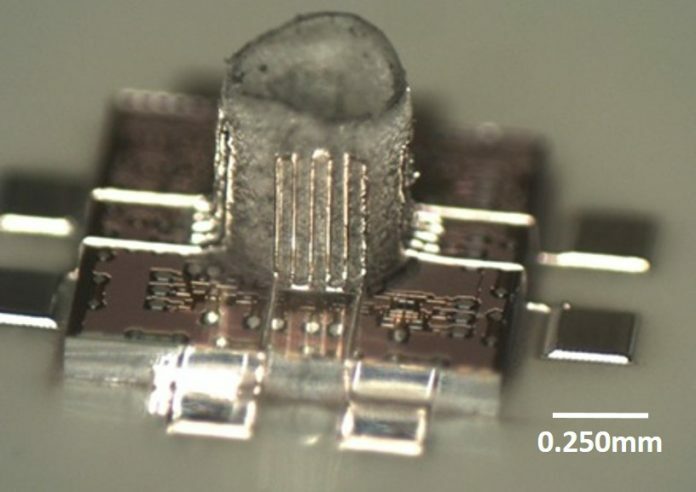 “Aerosol Jet 3D micro-structure printing is capable of ultra-high resolutions with lateral features sizes down to 10 microns, and lateral and vertical build resolutions from 1 micron to 100 nanometres respectively,” the company said in a press release.